We arrived in Kirkwall, Scotland and went on a tour of the local archeological sites. 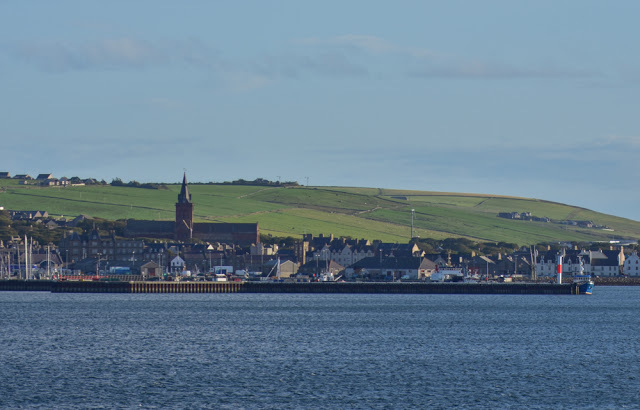 The Orkney Islands have been inhabited for a very long time. We visited Skara Brae, a remarkably well preserved Neolithic village that was first inhabited over 5000 years ago. Part of the reason for the preservation is that it remained completely buried for thousands of years. It was rediscovered in 1850 and not really excavated until the late 1920s. It feels strange to walk through a village with obviously recognizable dwellings and think that people lived here successfully over 5,000 years ago. 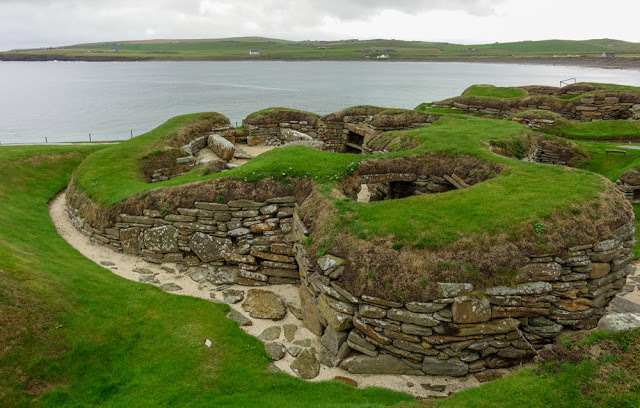 Skara Brae Neolithic village, from ~3180 B.C. Ring of Brodgar, erected ~2500 B.C. 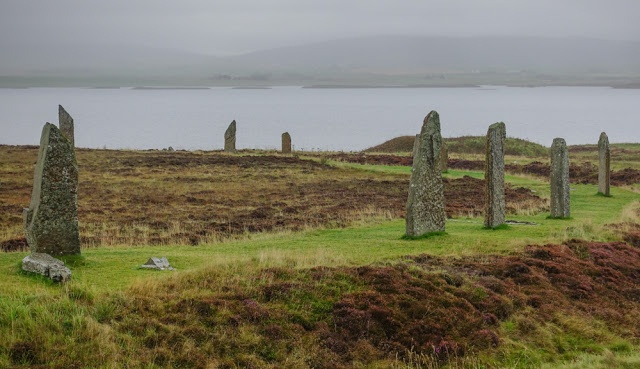 The weather for the day ranged from downpour to occasional sunshine, and while we had good weather at Skara Brae, we wound up visiting the standing stones at the Ring of Brodgar in the rain. This is a large ring of standing stones older than Stonehenge arranged in a large ring in the middle of a field. 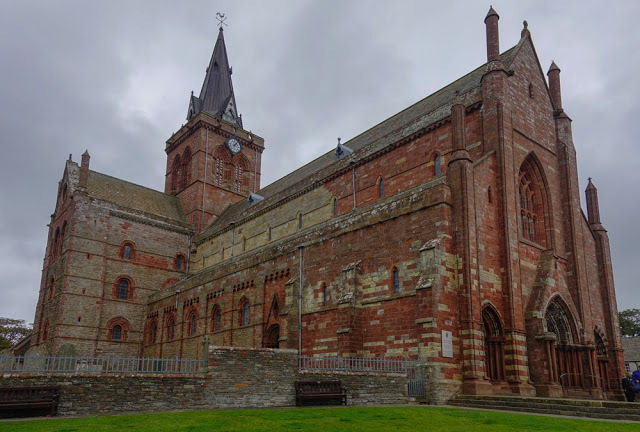 St. Magnus Cathedral, founded 1137 A.D.
We got back to town in the early afternoon and walked around a bit, took a look at the imposing red stone St. Magnus Cathedral which seemed outlandishly huge for a town this small, and then went on a tour of the Highland Park Distillery. 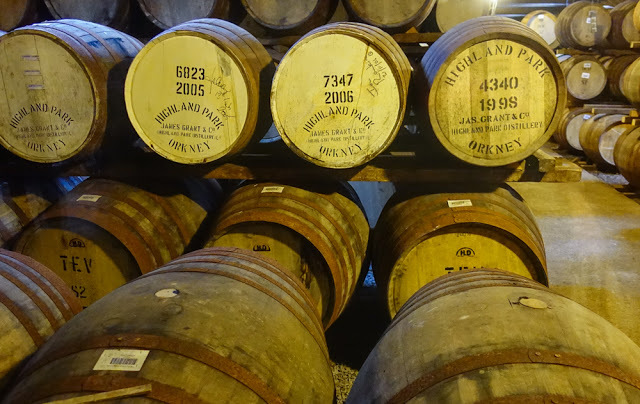 The tour was interesting as the guide took us through the full process of making and storing whiskey. For extra color and explanation, we also had Dave Broom, an expert on whiskey, with us as he is doing a bunch of lectures on the Ship. 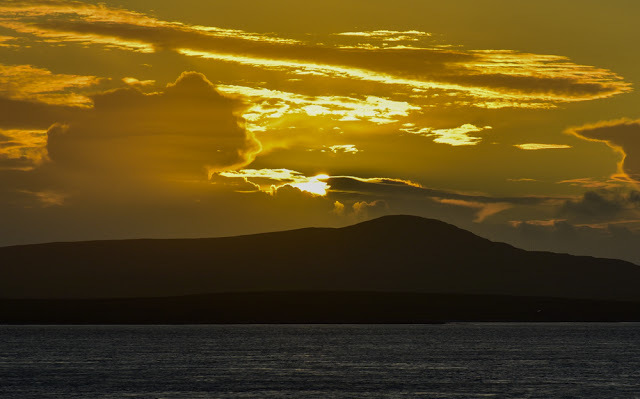 We got sunshine and spectacular views of Orkney as we were sailing out. We had dinner onboard, listened to the trio in Regatta for a while, and got to see a nice sunset as we sailed further south.